Update: We got some mystery packs from the pin trading station behind Spaceship Earth and the one between England and France, we had four really good bags and ended up with about half of the surf boards and plushes, two chasers, plus a couple of others and a few duplicates. So far I've only seen a couple of the kitchen series on cast lanyards and pin boards but we're still looking for more! More 2018 mystery pouches found today at Hollywood Studios! 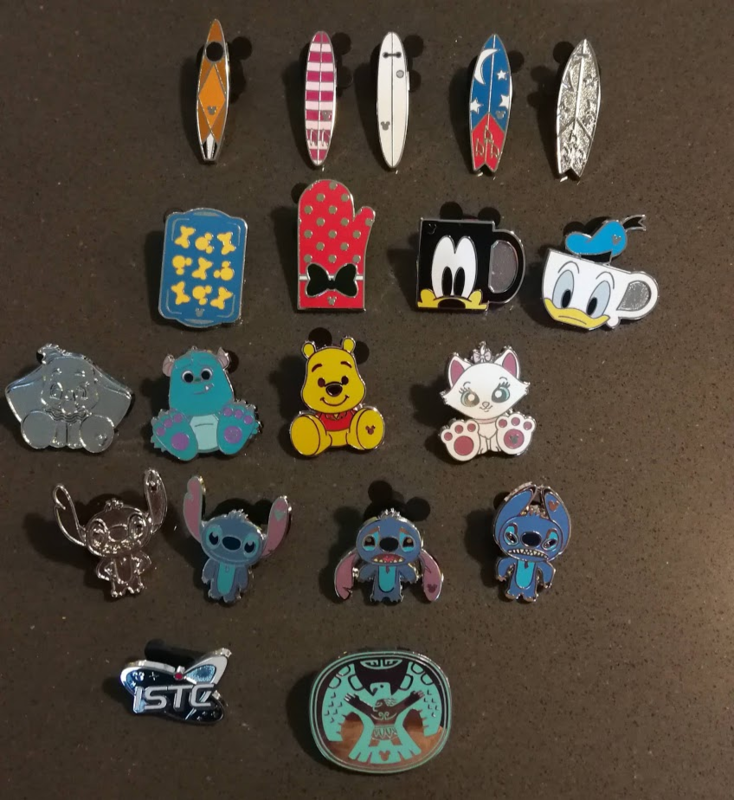 This was our final haul from WDW of the 2018 series, most from mystery bags but we did find the Sorcerer Mickey surf board with a cast member, and one of the security people at the AK entrance had the DLR Maui pin and jumped at the chance to trade with us when she saw our traders during the bag check! We also traded many 2018 duplicates from our mystery packs so I hope some lucky DPF members found them! Ajk, cadien, TheMickeyMouseRules and 2 others like this. NOW I'll have to hunt for the red oven mitt (for a friend) and the ISTC Pin for our Epcot Logo set. "Good Grief"
Is the oven mitt the completer? I found the mint green bags at the store in the Contemporary Resort on Saturday. I bought ten bags and only managed one completer (oven mitt). I really dislike this idea of having to pay for pins I already collected through cast member trades in order to obtain the completer pins. It USED to be that the Completer Pins were sold, 1 per bag, as the purchase with purchase pin. That wasn't too bad as you got a Completer pin no matter what - maybe just not the one you needed. This new trend may be the future of HM Pins - a quick, limited release on Cast Lanyards and then you HAVE to buy lots of bags to get your sets completed and get the Completer Pins. I remember the bags with purchase. Weren't they like $3.75 or something? What killed the PWP, was last year, when the selfies were 3.99 with $30 purchase, then suddenly increased to 5.99 plus tax. I hadn't realized till I checked my receipt, and couldn't return them, they're mystery bags. The incentive was lost, so the pins sat there. I haven't seen any PWP sonce then. Ajk and Shelterkat like this. WAVE A HM have been FOUND and are on CM lanyards at DLR!!!! watzshakinbacon, ItzaPinfan, Ajk and 1 other person like this. The bottom row is all for trade for anyone looking. I would love to finish up the alice collection and I also collect stitch. Also, on the scrooge, thoughts on whether he is legit ? There are scrapper warning for him, but the paint and edges all look good. 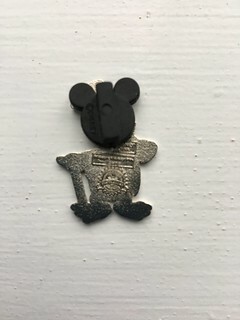 He's an older pin so I am not sure if he would have had a mickey pattern on the back or not. He was actually being used to anchor a ribbon around a pin board and I asked if I could trade for him. 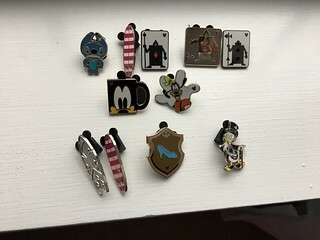 My observations on pin hunting are below the pics. As we know the hidden mickey's a very hard to find. Most cast member told me they went quickly. At my resort, one member told me she knew a bag of them had come in, but didn't know why they weren't on out anywhere yet. AK continued to give me the most luck with pin hunting. I grabbed 5 of my pins, which is almost half, from there. It's been about 2.5 years since my last trip but I noticed fewer cast members with lanyards, and fewer boards. I was surprised to find AK and Epcot no longer had books at guest relations. I noticed a lot more cast members with mystery pins - some even had their entire lanyard as mystery pins, so you were taking a gamble. When I told a few I was specifically hunting for the new Alice pins, they were nice enough to tell me none of their mystery pins were those pins. In short, I think disney is trying to control the pin trading issues, but it has also made it harder, especially for us non frequent visitors to find and complete sets in a trip. I don't when I'll go back and if I can finish my sets! Can the CMs just get rid of the triangle WDW flag pins ? They've been faked like crazy. No one collects them, and they are EVERYWHERE. Do the pin traders a favor and get them off the CMs and boards and replace them with some newer pins. Seriously, I bet a quick audit would turn these up on more boards, pins books, and cast members than not. repti.and.ptds_4us, pincrazy and Ajk like this.